Thrift Inspiration, doing it the Chloe and Missoni way! This seasons knits at Net-A-Porter feature short sleeved cardigans. I am a great fan of these, as they are great for layering and are so cosy and stylish too. So, inspired by these delightful offerings on Net A Porter and not having one of my own, I thought I would customise what I already have. 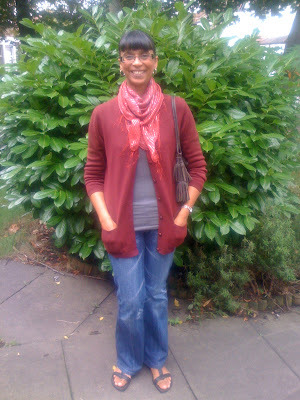 A few months back, I thrifted two lambswool longline cardis, in a wine colour and an indigo blue. I decided to customise the blue one and leave the wine coloured one intact! This is the end result of my handiwork-sleeves chopped off and rolled up and the lapels have been sewn back with original buttons to create a V neck rather than the original round neck, which I prefer. As you can see, it is an ideal layering piece to keep cosy in winter. I'm wearing a long sleeved grey tee underneath, studded belt, black leggings, black cowboy boots, H&M beanie, my Gucci pendant necklace and my gorgeous Diana ring from the lovely WendyB. So, what item in your wardrobe will you be daring enough to chop up-LOL!! 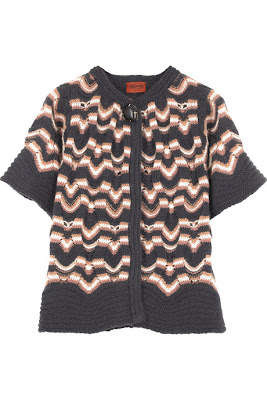 I love the Missoni one. Hi janettaylor-yes, me too!! Have a lovely day my dear! Oh yeah! Short sleeved cardigans are great! I especially love the Missoni one. 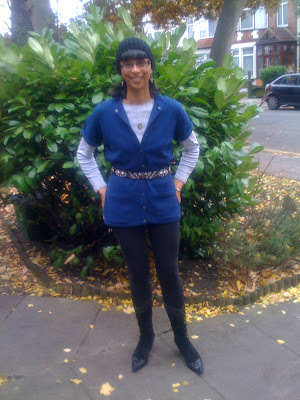 Hi cate-thanks for your lovely comment, I think where I have a few cardis, I didn't mind chancing this blue one, haha!! long cardis are great for late fall and and even into the spring with the chill about. I love layers toos. I like my long sleeve T's under my T-shirts this time of year for me and my boyfriend too. Thanks for reading and I love your comments too. Hi ellies kyle-thanks, as always for your lovely comment!! 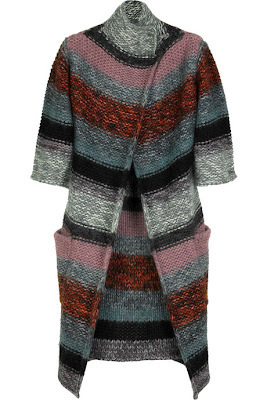 Love the Missoni cardigan, Sharon! Your cardigans are amazing, and inspired me to do something similar with some old ones. Great idea! Hi Silje-thanks for your lovely comment, I'd love to see how you customise yours!! Sharon Rose, Hi! Glad you liked my citron pants! Aren't they weird? I love your blog! How on earth do you find this stuff? Okay, we must be soul sisters, because my prized possession is my vintage cheetah coat! Go on my blog and look under the August or September posts. August I think. There is an article or post called, "Vintage Cheetah Coat, How Do I Love Thee Let Me Count the Ways!" Go Look! Great handiwork on the cardigan Sharon! Hi karen-thanks for stopping by!! I'll definitely be over, I'm adding you to my blogroll too! Hi ladies who lunch-so kind, thanks a lot! Great layering! You look lovely. I just love the Missoni one..
Did you do the chopping with your own hands? darling i love what you did with blue cardi!!! you look terrific sweetie.love the open neck.love scarf of the second image,you look absolutely styling! darling thanks for the lovely birthday love,just updated blog on what i got up to! have a great wk dear. you see the dare-devil in me, don't you? Hi savvy-yes, the length of the Chloe one is lovely! Hi a cat of impossible colour-thanks so much, so lovely of you!! Hi wendy-LOL, yes I debated using the axe or machete, but ended up with hairdressing scissors for the job! Hi marian-thanks for your lovely comment, so pleased your weekend was fabulous, have a great week too! Hi sydney-well, you need to choose items that if it goes wrong, you won't mind it going to the charity shop!! wow good job! i couldn't even tell you changed it! Hi ren-thanks so much my dear!! love how the blue cardi turned out. and the chloe is my dream sweater. Hi fashion herald-so pleased you like it, thanks a lot! You look quintessential L.A. in this last photo! Hi karen-oh, thanks so much my dear! !